Like most professionals, I struggle to find time to sneak in a good work out. I’m not a morning person, so runs before work are torture, and I’m honestly too lazy to turn up at yoga after a long day. Which is why when I found out the benefits of standing up at your desk, I embraced it wholeheartedly and have tried to spend a couple hours a day working while standing. “The issues with treadmills are that you don’t set your own pace, and they’re not interesting as furniture,” Godshaw told The Huffington Post. 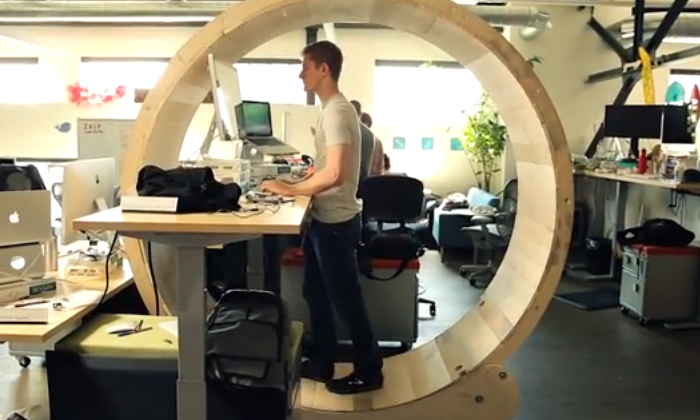 However, the hamster wheel desk isn’t something to be taken lightly. “We considered adding in brakes but decided against it in order to really force the productivity out of the desk user,” the designers wrote on Instructables. While this might cause some to approach the wheel with caution, we say it just adds another element of excitement to another routine day at the office. Apps for its mechanics, digitalisation of its performance management system, and more - let's see how this manufacturer has used H..